This movie is fictional. However something like what is depicted in this movie could definitely happen in some of the more dangerous countries in the world. What is not believable however is that under the conditions where an employee of a major American water company has to take a job anywhere in the world where there could be some danger, then he would never take his wife and 2 young girls with him and would only move there himself. This is where the movie fails as far as its the story being believable. Aside from this flaw this movie is quite hard to watch due to the extreme violence of gangs engaging in a coup due to the presence of an American Water company and what seems to be a misunderstanding as far as this companies intentions in their country. 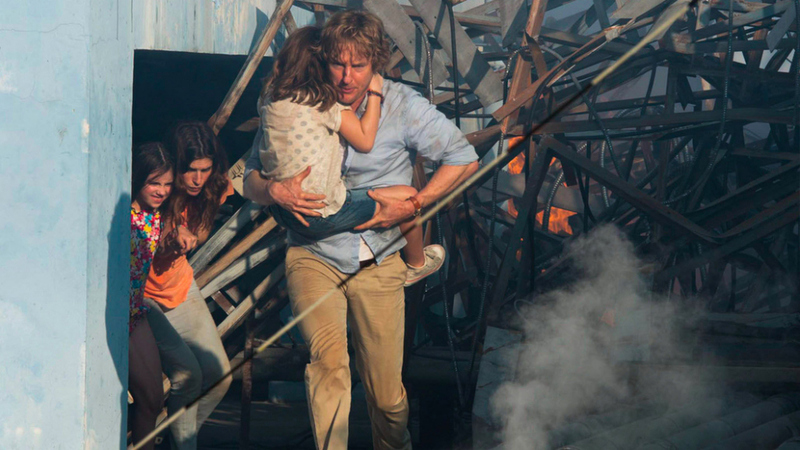 During this entire movie, the main character (played by Owen Wilson, his wife and 2 young girls) are in constant danger and close to be being killed many times. During the uprising many people in the hotel where Wilson’s character and his family are staying, both Americans and citizens of the country are murdered and many of the scenes of violence are extreme and hard to watch, especially because the 2 young girls are in constant danger of imminent death. Overall, I do recommend this movie but it is very hard to watch. The movie could be improved by perhaps trying to explain why the main character would take his family to live in such a dangerous part of the world, although considering the circumstances of this movie that would be very hard to explain anyway. I have always wondered why certain movies get made, why they were selected from so many thousands. How they broke through the impossible hurdles that any screenwriter would find when he starts to write movies. I am always amazed at some of the bad movies that get made, given the impossible and unfair barriers in this industry starting with even getting an agent. The movie “American Ultra” is another example of a bad movie that somehow got made. First of all the title American Ultra makes no sense and neither does this movie which is nothing more than a collection of disconnected action scenes and insane ideas that together create one bad mess of a movie. One thing you have to do nowadays to get a movie made is to make something very different, that has never been done before, but what this movie lacks is “weirdness wrapped in a good movie”. Its great to be different and weird but the quality has to be there too and there was no quality in this movie just lots of weird scenes. I was surprised to see the lead actress Kristen Stewart in this movie proving just how fleeting and fickle top of the box office fame is. Why she would pick this movie to make probably says more about her potential prospects than her acting talent and that is a shame because she deserves to make a better movie than this one, especially after to recently being on top of the world with the “Twilight” movies. Jessie Eisenberg is also miscast here as an unknowing secret agent/robot who has many action scenes but his physical presence does not support this role and he also deserves to be in a better movie than this one. You have to figure that there was a favor that was paid somewhere to someone to get two top young actors in a movie this bad especially considering that the writer of this screenplay and director are largely unknown. Compton California is a typical slum, ghetto within the city of Los Angeles from which spawned the beginnings of rap music in the late 80’s and early 90’s. For the most part rap music is not really music at all but instead is mostly rhymes and rhythms that are loaded with the worst kind of vile language and stories about abusing women, killing police officers, violence and inciting riots. One of the famous songs from the rap group NWA in this movie is actually entitled “F the police”. Clearly songs like this and many more like it incited increased problems within the ghettos in this country with the police. One of the mysteries this movie unveiled is the insanity of how music that is riddled with the worst kinds of foul language was even allowed to be released considering the restrictions placed on music by the FCC. It seems that Freedom of Speech won out over common sense and Government regulation. There have been some rap songs over the years that are actually good, rapper M&M’s hit in 2002 “Lose Yourself” actually won the academy award for best original song. However the great majority of rap music is horrible and is not music at all and its amazing that this genre of music ever became popular in the first place. What is more amazing is how so many very lucky young men have become extremely wealthy from music this bad much less all the peripheral products including clothing, perfume and even alcohol over the years. One of the main characters in this movie Dr Dre is now actually a billionaire from his rap empire and the Beats music products and high performance headphones. Were it not for rap its clear that many of the real life characters in this movie would now either be in jail or dead and I sure hope they consider themselves some of the very luckiest people on planet earth. As far as this movie it is well acted, told well and is a good history lesson about rap music in the late 80s and 90s. The actor Paul Giamatti is as usual great in his role as the agent and visionary for this group who took a chance and signed them and was very sympathetic and supportive with their many problems in the police, but later in the move it seemed he was not treating them fairly as far as the money the group was making – nothing new there. Overall I do recommend this movie, but I think that its too long, close to 2 1/2 hours. I think the same story could have been well told in 2 hours with perhaps less musical numbers. 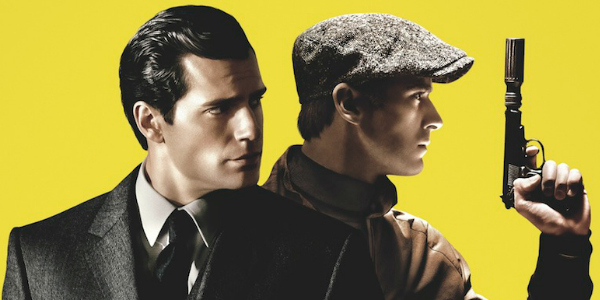 Its taken over 50 years but they have finally made a movie based on this 1960’s series. Well the series was not that good and neither was this movie. This movie looks like it was shot and created in fragments and the audience has no way of knowing what is going on from one scene to the next or how the scenes are connected. I always wonder how movies like this are made and how someone could cut and direct this film, never realizing that the sequence of events are not explained and the reasons why things happen in this movie make in many instances, no sense at all. The film also is trying to make itself look like it was shot in the 60’s which just makes the movie more difficult to watch. The female lead in this movie, Alicia Vikander is the only positive part of this whole movie because of her acting and presence on screen. She also played a Robot in the movie Ex Machina which is a movie also reviewed in this blog. Alicia Vikander definitely has a great future making movies, she can act and she looks great on screen. As far as the Man from U.N.C.L.E. avoid this movie because unless your a huge fan of Alicia Vikander its mostly a forgettable waste of 2 hours. This movie reminds all of us about one of the main reasons why we all go to the movies. Its because we want life to work like the movies do; a happy ending or a love story, some laughs a temporary escape from reality but most importantly we want the evil people in this life to get what they deserve, but unfortunately real life rarely works like we want it to and like we see so often in the movies. The movie “The Gift” is an excellent and very well written thriller about bullying and how it might come to a conclusion years later in adulthood. This movie is about the fact that for the most part there is “no measurable lower limit” as what some people will do to get ahead or to destroy the life of someone who has done nothing to them. The human phenomenon of some sick people in this life who derive pleasure in humiliating or ruining the life of another human being and from that somehow feel better about themselves is the central theme of this movie. It is very clear that people like the main character in this movie (played very well by Jason Bateman) do not believe in God or in heaven or hell and they have never bought into the concept of doing onto others as you would have them do onto you. This story was told very well with many surprising twist and turns and in the end the point of this movie is that most bad people never change and that at least in the movies sometimes, “what goes around comes around”. The ending of this movie was very surprising although some of the action that comes at the end was predictable at parts earlier in the movie. The acting was excellent throughout and all the actors do an very convincing job; most especially Bateman who plays at first the good family man but in the end his true colors are finally revealed. I highly recommend this excellent movie. This movie answers two main questions. How do you make a 1 hour movie last almost 2 hours and is it possible for Meryl Streep to be in a very bad movie. The answer to the first question is; if you want a 1 hour movie with a very bad script to last two hours you insert about 10 very bad musical numbers to drag on the movie 50% longer than it should have been. The answer to the second question is; this has to be without a doubt the worst movie Meryl Streep has ever been in – in her entire career. You have to wonder why Streep took this role. Perhaps it was because she wanted to sing or perhaps because she thought that because Diablo Cody wrote the script and she is the same writer who won best original screenplay for Juno in 2007, that this movie just had to be great. Unfortunately Merrill was wrong on both counts because this movie was extremely bad across the board. From the horrible and long musical numbers (and there were about 10 of them in this movie) to the soap opera-like story and badly written dialog, this movie was very hard to sit through. The only good scene in this entire movie was the argument that Streep had with her x-husbands current wife and this argument had to do with the current wife being there for Streep’s daughter while Streep’s character was off trying to be a singer. The only upside to this movie is that it shows some of the real life of so many people who want to be famous or rich in show business and never make it. Streep’s character is bankrupt, living in a bad apartment and lives the life of someone who gambled on a dream and now almost 70 years old, lost that gamble. Do yourself a favor and miss this very bad movie. Why are there so many bad movies? This movie is not really a remake of the original movie that came out in 2005 and seems to be all about showing how the Fantastic Four came into being in the first place and with a whole new cast. In the case of this new movie, there is a good deal of up front explanation about an invention by the main character who eventually becomes rubber man which is a transporter that transports objects to an unknown fourth dimension. What is unusual about this movie is that there is a long time setting up the idea and then an extremely abrupt ending which I thought hurt the overall effect of the movie. The special effects for the most part were good to very good and the acting especially by the very attractive Kate Mara was very good. Its not clear that there will be many sequels with this new cast of the Fantastic Four and that will depend entirely on the box office this weekend and the upcoming weeks. I do recommend this movie but it could have and should have been better and had a better ending. At this point, after some 50 years of Woody Allen movies I think everyone would agree that we all like the funny movies he has made the best, and the best of those was 1977’s Annie Hall which is the first and only comedy to win best picture as a comedy. As far as the movie “Irrational Man”, which is a very serious movie, overall it was good, but not good enough to be remembered as one of Woody Allen’s best serious movies. This story has some philosophical ideas about life, why we are all here, and these are the reasons why, a College professor played by Joaquin Phoenix, is so tortured to the point that he is an alcoholic and rather suicidal. After overhearing a story about a woman who could lose her kids because of the actions of a very bad family court judge this professor is able to give himself a new reason for living by committing the perfect crime and killing this judge. After this the movie is about clues that come up with his girlfriend and her eventually discovering that he has committed this crime and the predicatable conclusion. This movie was for the most part entertaining, but not compelling enough to recommend it as a movie that is really worth seeing. For that reason I am neutral on this movie. If you are a fan of Woody Allen you should see this movie, otherwise this can be missed. While sitting through this horrible movie, it was hard to imagine how the people who financed this garbage were ever stupid enough to somehow not know how bad this idea was, or how unfunny this movie would turn out to be. For me the scene that says it all was the moment when there was a very attractive woman on a highway looking at the main character in the movie played by Ed Helms ad suddenly she drifts over to another lane and is killed by a head on collision with a truck. Somehow, someone responsible for this horrible movie thought this was funny? How could this be considered funny? Why would they think anyone would find this funny? Perhaps Charles Manson would find a head on collision funny, but certainly no normal sane adult. During the entire 2 hours of this movie nobody in the audience laughed even once, but why would they? There was one ongoing fight between the younger son of the new Griswald family who was bullying the older son, who it was suggested might be gay. There was a scene where the entire family accidentally thought that a sewage pond was a hot spring. There were several almost car accidents on the highway in this movie, one involving a Mac Truck. At the end of the movie the family visits the original father of the first Vacation movie which was played by Chevy Chase. Chevy is now looking both very old and very overweight and the ending scenes with him were some of the least funny in the whole movie. This movie was very bad and I do not recommend it. Its only a movie? Isn’t that a true statement? I think that its correct that a movie is really just a movie and not worth the life of any human being, but in the past while making movies people have died because of a fluke that went wrong or some mistake or some other reason where someone was not doing their job. The worst tragedy in movie history was probably the movie Twilight Zone with Vic Morrow and 2 Vietnamese children he was carrying into a lake were killed by the blades of a falling helicopter. The point of all this is, “Its only a movie”, why would anyone want to risk their life to make a movie? Well for whatever the reason, Tom Cruise is definitely one of those people and at the rate he is going by taking these kinds of risks in these Mission Impossible movies; there is a very good chance that he will be killed one day just going a little too far. On 4 occasions in this movie, Cruise could have been killed. The first was by hanging from a large Airbus plane and I hear there were 8 takes for this one scene. During this first scene, Cruse ran close to the large propellers of this airplane and he could have been if he was blown into them. Tom Cruise mentioned on a talk show that he held his breath for 6 minutes and he trained for this for a long time, but this is also extremely dangerous. Obviously this is completely unnecessary and insane to take risks like this for a movie. There is also a scene of great danger riding a high powered motorcycle on a highway that was very dangerous with other cars and trucks that had to be avoided. Its clear that Tom Cruise should leave dangerous stunts like this to the stunt men, but for some reason he insists on taking severe life threatening risks that one day will cost him his life. As far as the movie I thought that the story was a good one and it was easy to follow, which is not true of previous Mission Impossible movies, especially the first one. The main female lead in this movie was very believable in her role and her fight scenes were very well done and she is very attractive as well. Other actors from previous Mission Impossible movies also returned even though Ving Rhames had a very small role in the last Mission Impossible movie “Ghost Protocol” where Tom Cruise took many risks on the worlds tallest building in Dubai. The ending of this movie was very satisfying but not believable based on how they were able to trap the lead villain in a giant Plexiglas box. Overall I thought this movie was well done and I do recommend it.